This is a decadent way to get good fats from avocado. You would never even know it was in there. I also love to add cayenne pepper to foods it works well with, as it has a large number of health benefits. 2. Blend the avocado and orange zest in a food processor and add the chocolate mixture. Keep blending until smooth. 3. Add enough cayenne pepper to give it a kick, but be careful, it should not be spicy. 4. Garnish as you wish. Kale chips are a delicious way to enjoy nutritious food! Say goodbye to the potato chip cooked in sunflower oil and say hello to a new breed cooked in a zingy dressing . 1. Preheat oven to 120c. 3. Massage the mixture into the kale, making sure each leaf is coated. 4 Lay the kale in single layers on parchment lined baking sheets. Bake for 30 minutes until crisp, flipping the kale leaves once or twice during cooking. Let cool before serving. Keep in an airtight container to keep them crisp. They can also be done in a dehydrator over night. I served mine with my creamy cashew sauce with coriander, but they are just as good on their own. This dish will fool you into thinking you are eating a grain, when in fact you are eating a vegetable! The consistency works really well and it also tastes pretty good. Combine all of the sauce ingredients in a blender. Purée until smooth and set aside. Taste and adjust flavours if necessary. 1. To prepare the cauliflower, place the florets in a food processor and pulse to a "grain consistency". 2. Add the fat to a wide pan over medium heat. Add the onion and sauté until softened, about 5 minutes. 3. Add the cauliflower and season with salt and pepper. Cook, stirring often, until the cauliflower softens, about 15 minutes. 4. Add 120ml of the sauce to the cauliflower and cook for another 10 minutes. 5. Add enough sauce to coat and mix well. Season with salt and pepper to taste. 6. Garnish with the pumpkin seeds and herbs. 2. Add the dried coconut to a food processor and pulse until finely ground. Remove and set aside. 3. Add the almonds and seeds to the food processor and pulse again until finely ground. 4. Add the dates and apricots and pulse until well incorporated. 5. Add the coconut butter, spirulina, raw cacao, orange zest and salt and pulse one last time. The mixture should stick together but not be wet. 6. Pinch off a little of the mixture, roll it into a ball, and roll it around in the coconut flakes. 7. Repeat with the rest of the mixture. Here is one I fermented in March ready to be enjoyed, and one I started fermenting in April without the beetroot. 1. You can use a Kilner jar which you can buy in most hardware stores (one with a rubber seal and clasp) or else you can use a wide mouth glass jar with a tea towel and rubber band. 2. Place all the ingredients in a bowl in batches, sprinkling each batch with a layer of sea salt. I find the best way to release the juices is by massaging it with your hands until it breaks down and becomes soft. You might want to wear a pair of protective gloves. 3. Pack very tightly into jars, pushing it all down until it is completely submerged by liquid. The most important thing is to make sure it all stays under the liquid or the top will turn mouldy, I usually weigh it down with another glass jar sitting inside. 4. Close the top of the jar or place a tea towel over it and place a rubber band on the outside so nothing can creep in but air. 5. Let it ferment on your counter for 4-8 weeks, depending on how you would like it to taste. 7. Enjoy with breakfast lunch and/or dinner, it will help you digest your meals along having many other health properties. This coconut soup is a delicious & nutritious Thai inspired dish. This is a great dish to make for a dinner party. Make sure you use wild caught prawns as farmed prawns can be toxic. Heat a large pot on medium heat. Add the oil and sauté shallots, chillies, ginger, lemongrass, and pinch of salt until fragrant. Add the mushrooms, stir, and cook until shallots just start to soften, about 5 minutes. Deglaze with a small amount of stock. Add coconut milk, stock, tamari, and kaffir lime leaves. Bring to a simmer. Simmer lightly for 20 minutes, stirring occasionally. Add the peas and prawns and continue to simmer for about 4/5 more minutes, until prawns cooked through. Add lime juice, taste and season with tamari, fish sauce and more lime juice if needed. Try and take out the lemon grass and lime leaves as they are not edible. Sprinkle with a generous amount of coriander and taste the wonderful flavours. The ginger and lime add complexity to the flavor of this warming soup. The addition of cayenne, turmeric, and garlic add additional flavor as well as health supportive properties. the onions for 10-15 minutes, or until translucent. Add the shallot, ginger, turmeric, and kaffir lime leaves and sauté for another 10 minutes, or until the shallot is translucent. 2 Add the garlic and sauté for another 1-2 minutes or until fragrant. Add the sweet potatoes, and continue to sauté for another ten minutes or until a fond begins to develop on the bottom of the pan. 3 Deglaze the pan with about ½ cup of chicken stock. Add the coconut milk and remaining chicken stock and bring the liquid to a simmer. Simmer the sweet potatoes until tender, for about 10 minutes. Turn off the heat and remove the kaffir lime leaves. 4 Ladle about a third of the mixture into a blender and blend on high until smooth, about 1 minute. Pour into a large bowl and repeat with the remaining soup. Return the blended soup to the stock pot and heat over medium heat. Add the tamari and cayenne. Season with lime juice and salt to taste. Garnish with coriander. This is a simple recipe which is not only extremely healing, but super tasty too. The bone broth is beneficial for the digestive tract and boosting the immune system while the spinach will help alkalise the body, and contains more calcium than milk. 1. Melt the coconut oil to a big pot and add the onions. Sauté until soft, about 5 minutes, then add the garlic ginger and courgette and sauté for a further 5 minutes. 2. Add the stock and bring to the boil, simmer for about 8 minutes until the courgettes are cooked. 3. Add the spinach, nutmeg, coconut milk, lime juice & salt and stir for a minute or two. 4. Transfer to a blender in batches with the basil, taste and adjust flavours to your liking, adding more salt or lime if desired. This is a delicious dairy free chocolate recipe that is so simple to make, it only takes 10 min prep and 20 minutes wait. Go on, spoil yourself! Pour the mixture into a baking dish and spread evenly with a spatula. Place dish in freezer for 20 minutes. Cut into pieces, enjoy and share!!! Line a small loaf tin with baking parchment. Place banana, eggs and olive oil in a blender and blend until smooth liquid. If you don’t have a blender, mash the banana as much as possible and whisk into the eggs and oil. Mix all dry ingredients together and add the wet mixture to it, mix well to form a batter. Pour the batter and shape well into the tin. Bake for 40-45 minutes until nice and brown on top. 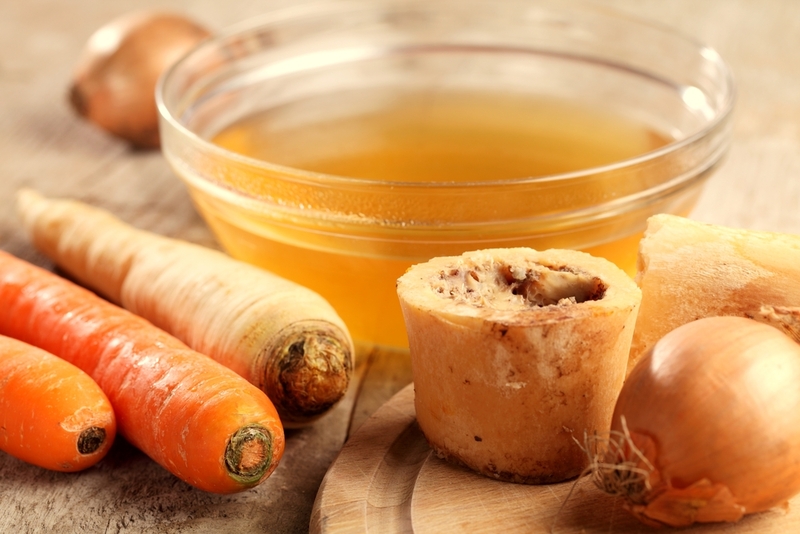 Here are 10 great reasons to start making bone broth. 1. Fights infections such as colds and flu. 2. It heals a leaky gut. 6. Homemade bone broth is cheaper and healthier than store bought. 2. Add bones to stock pot with the vinegar or lemon juice and enough water to cover the bones. 3. Bring to a simmer, removing any scum that rises to the surface. Simmer very lightly for 8-45 hours. (the longer the better) you can even make 2 or 3 batches of stock out of the same bones, to get the most out of them. Add more water when needed. If you have a slow cooker transfer to this after 3 hours and set on low setting. 5. Strain through a fine strainer. 6. Cool completely before refrigerating. 7. The broth will gel when sufficient gelatin is present. It will keep for 5 days in the fridge or it can be frozen for several months. You can use lamb bones, fish bones and shrimp shells. Chicken can also be used, but does not need as much time simmering, 6-24 hours. It can be enjoyed on its own, used to cook beans and grains, or of course, in a soup.